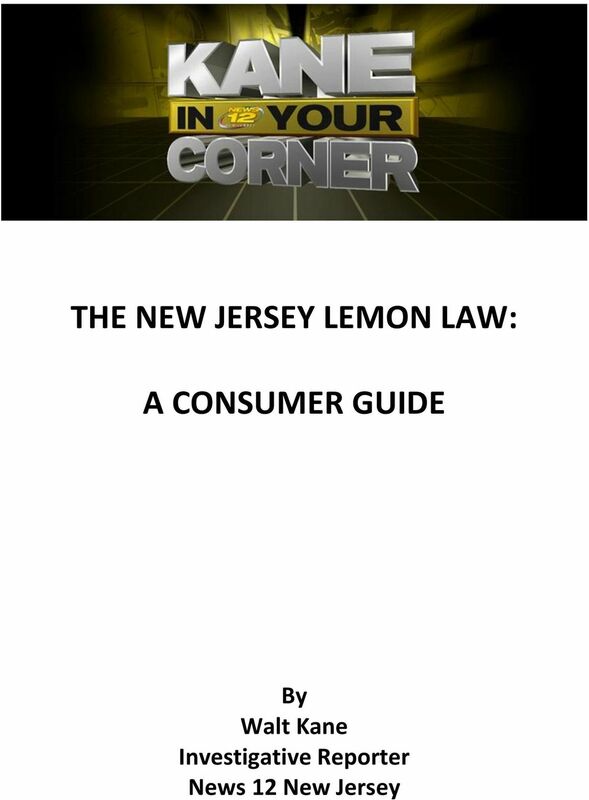 Download "THE NEW JERSEY LEMON LAW: A CONSUMER GUIDE. By Walt Kane Investigative Reporter News 12 New Jersey"
2 INTRODUCTION Few things are more frustrating than buying a new car, only to have it keep having problems. Fortunately, New Jersey has one of the strictest Lemon Laws in the country, and it sets out the rights for car owners very clearly. For the most part, it s pretty easy to find out if you are covered or not. One important note in advance: I am NOT an attorney so please don t consider any of this legal advice. This is simply my effort to provide you with the best information I have based on 18 years of covering investigative and consumer news in New Jersey, so that you can be the smartest consumer you can be. Good luck! THE NEW CAR LEMON LAW What can the Lemon Law Do for Me? If you are covered by the New Car Lemon Law, the car manufacturer must provide relief. That could mean getting money back or, in some cases, a full refund or even an entirely new car. What if I am NOT Covered? Then the repair could be on you. Or, since the car should still be under warranty, the repair will likely still be free, but the car will continue to be your problem. How do I know if I am Covered? If you buy a car NEW, the Lemon Law kicks in if one of the following three things happens during the first two years or 24,000 miles (whichever comes first): 1. If the car is off the road for the same warranty repair three times (twice if the situation is life threatening) Or 2. If the car is in the shop for any warranty repairs for a total of 20 days. Or Again, one of those things has to happen in the first two years or 24,000 miles (whichever comes first) that you own your NEW car. And, of course, you have to be able to prove it. So save your repair receipts and records. 3 You keep saying NEW car. I bought a USED car. Is it covered? Yes and no. New Jersey also has a Used Car Lemon Law but the protections are not nearly as good. I ll spell out that law later on. Do I talk to the dealership where I bought the car about the Lemon Law? NO. This is a key thing that many buyers don t understand. 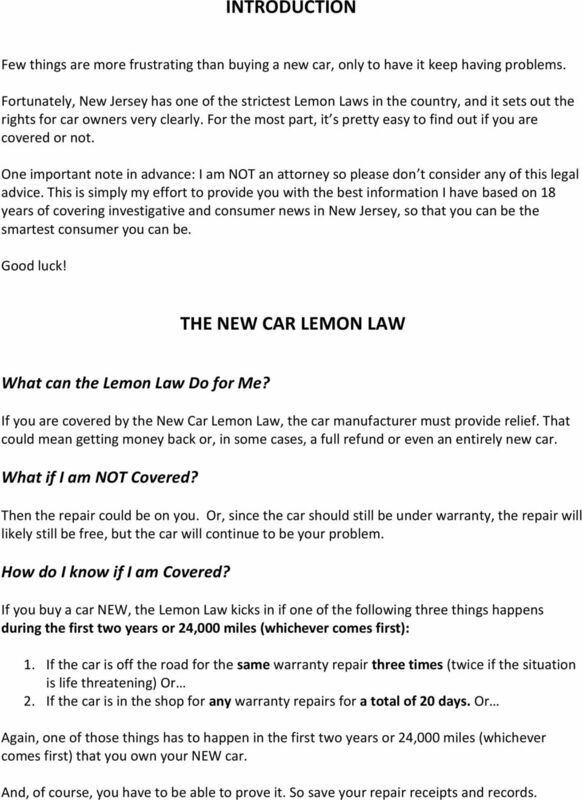 The Lemon Law applies to the manufacturer (Ford, GM, Toyota, etc.) That is who you would take action against, not the individual dealership that sold you the car. OK, I think I want to file a New Car Lemon Law claim. How do I do it? If you want to pursue a New Car Lemon Law claim, you have two options: You can hire an attorney and go to court, or you can contact the New Jersey Division of Consumer Affairs Lemon Law Unit. If they accept your case, you would then appear at an administrative proceeding before an Administrative Law Judge either with or without, an attorney. 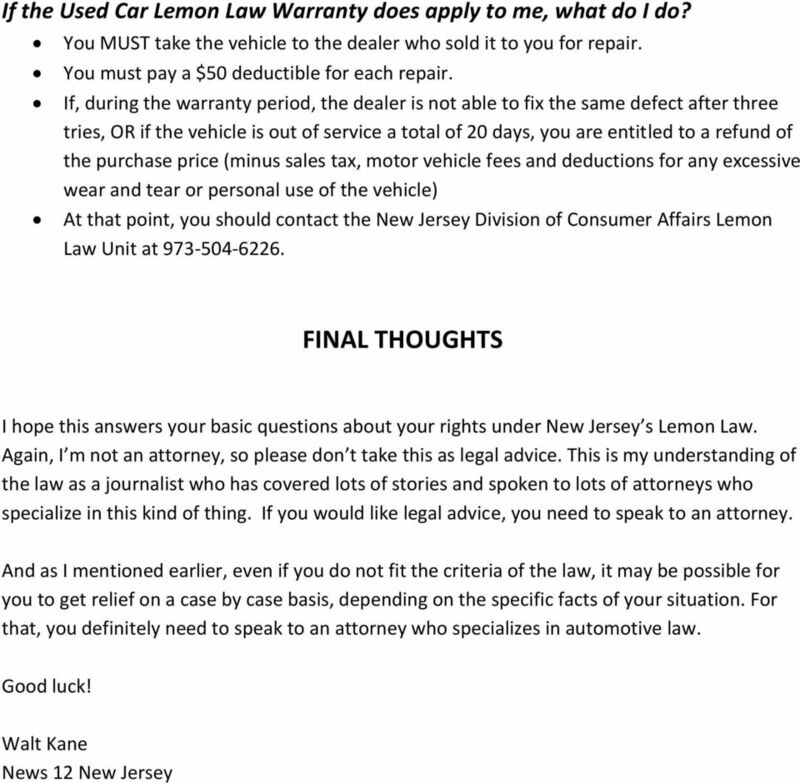 For more information, check out this handbook from the New Jersey Division of Consumer Affairs at: It looks like my car is NOT covered by the Lemon Law but I still think I got a lemon. Isn t there anything I can do? There might be. In some cases, there are extended protections under a federal law known as the Magnuson Moss Warranty Act. Sometimes there may be product recalls that apply. But this is a case by case situation. You d have to research your situation or contact an attorney who specializes in automotive law. 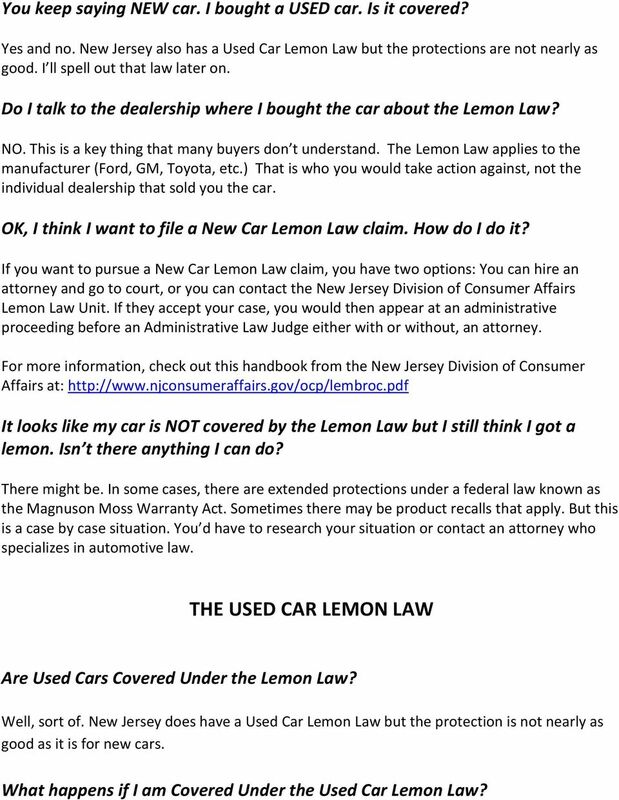 THE USED CAR LEMON LAW Are Used Cars Covered Under the Lemon Law? Well, sort of. New Jersey does have a Used Car Lemon Law but the protection is not nearly as good as it is for new cars. What happens if I am Covered Under the Used Car Lemon Law? Setting the record straight about accusations by Consumer Reports regarding automobile dealer Trick selling practices. Note: All information provided is for cases and matters occurring in North Carolina, unless otherwise stated. The information provided is not meant to be legal advice and should not be construed as such.